In 1961, Lee Iacocca, Vice President and General Manager of Ford Division, had a vision. His vision was a car that would seat four people, have bucket seats, a floor mounted shifter, be no more than 180 inches long, weigh less than 2500 pounds, and sell for less than $2500.00. Out of this vision, the Ford Mustang was born. After many months of meetings, discussions and market surveys, funding was finally approved for the Mustang in September of 1962. 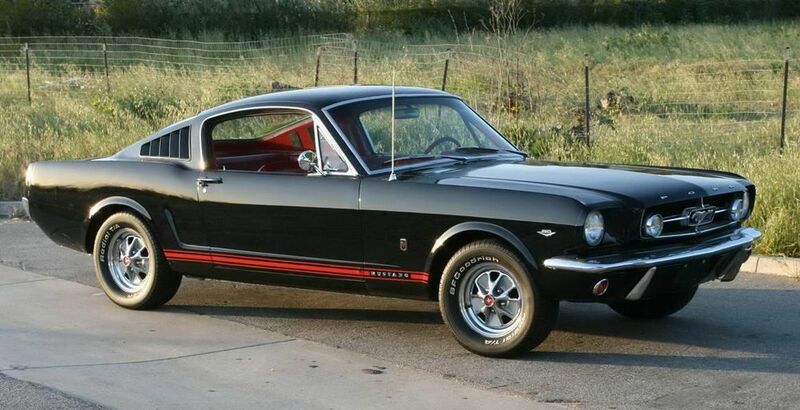 On March 9, 1964 the first Mustang rolled off of the assembly line. Only 18 months had elapsed since the Mustang had been approved for production. In order to keep production costs down, many of the Mustang's components were borrowed from the Falcon, including most of the drivetrain. With a multitude of different interior, exterior, and drivetrain options, the Mustang would be able to be ordered as plain, or as fancy, as economical, or as fast, as the buyer wanted. In general, the Mustang was designed for everyone and was advertised as "the car to be designed by you". 1965 brought few changes for the Mustang. The biggest change was the availability of a new fastback model, which was to become the basis for Carroll Shelby's GT350. The 120 horsepower, 200 cid 6 cylinder engine replaced the 170 cid 6 cylinder, the 289-2V, 200 horsepower V-8 replaced the 260-2V, the 289-4V was upgraded to 225 horsepower, and the 289-4V hi-po remained unchanged. Other changes for the 1965 Mustang included: an alternator instead of a generator, relocation of the oil filler, integral power steering pump and resevoir (most 1964½'s had a remote mounted resevoir), a wire retaining ring was added to the gas cap, the horns were smaller and relocated, and the interior carpet was continued up the sides of the rocker panel and under the sill plate. A new interior option was added, the interior decor group (known as the pony interior), which featured special seat covers with running horses across the seat back, special interior door panes with integral arm rests and pistol grip door handles, five gauge instrument panel, woodgrain steering wheel, and woodgrain appliques on the instrument cluster, glovebox, and optionally on the center console. Another Mustang option introduced in April of 1965 was the GT equipment group. Available only with one of the two four barrel engines, the GT group included five-dial instrumentation, disc brakes, larger sway bars, quicker steering ratio, dual exhaust which exited through the rear valance panel, grill mounted foglights, and special lower body side stripes. A total of 559,451 Mustangs were produced for the 1965 model year. 1966 brought even fewer changes for the Mustang than did its predecessor. Most of the changes for 1966 were in the form of cosmetic refinements. A new grille which featured chrome edged, horizontal inserts, replaced the honeycomb grille of '65. The chrome bars that extended horizontally and vertically from the running horse were deleted on the 1966 Mustang's grille. A new three fingered rear quarter panel ornament was used. The lower rocker panel moulding became standard equipment, as did backup lights, and a chrome hood lip moulding. The fuel filler cap no longer included the plastic Mustang emblem insert found on the earlier models. On the inside, the Mustang was treated to standard five gauge instrumentation, and "woven" vinyl seat inserts. The choices of available interior colors and styles increased to thirty four varieties, giving the buyer even more ways to personalize "their" Mustang. Production increased to 607,568 units for 1966. 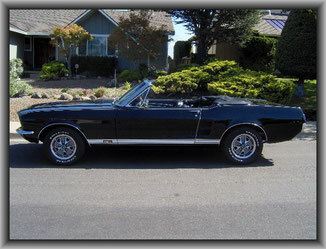 1967 brought the first major restyling to the Ford Mustang. The Mustang was starting to grow up. The length and heigth were increased, 2.7" and .5" respectively. The wider body allowed for the installation of a tire smoking, 320 horsepower, 390 cid engine, the first big block engine in the Mustang. Among new options for the 1967 Mustang were the tilt-away steering wheel, an overhead console, power disc brakes, and an all new transmission, the FMX, which allowed fully automatic or manual shifting. The Mustang fastback's roof line was extended to the rear of the trunk. Interior trim options were decreased from 34 in 1966 to just 20 in 1967. Production for 1967 slipped to just over 472,000 units. The 1968 Mustang was little changed from it 1967 counterpart. Most of the changes were in subtle refinements to the interior and exterior. New options for the 1968 Mustang included an AM/FM stereo radio, rear window defogger (coupe and fastback only), re-designed front power disc brakes, and the all new 302 cid engine. The 302-4V, 230 horsepower engine replaced the 289 Challenger Special of previous years. By December of 1967, the 289 engine was replaced entirely by the 302 version. Other changes included the deletion of the horizontal grille bars, the deletion of the F-O-R-D letters at the front of the hood, simplification of the quarter panel ornament, and many safety features were added. Due to increasing governmental regulations, the 1968 Mustang now included front and rear side marker lights, folding, flush mounted interior door pulls, and an energy absorbing steering column. There were several "region specific" models offered from various dealers. Two of the most noteable were the Mustang California Special, and the Mustang High Country Special. Total production for 1968 was 317,404 units. 1969 brought another major restyling to the Mustang. The Fastback 2+2 was gone - replaced by the new SportsRoof model. The new Mustangs were almost 4 inches longer than their 67/68 predecessors, yet they retained the 108" wheelbase of the original 1964½. The base Mustang engine continued to be the 200 cubic inch six cylinder. New for the economy minded Mustang owner was an optional 250 cubic inch six. The base V-8 continued to be the 302-2V. The 351-2V and 4V entered the lineup for 1969. The 302-4V and the 390-2V were dropped, but the 390-4V remained. There were two special engines offered for 69, the Boss 302 and the Boss 429. Both engines were only available in two limited production units, so called, the Mustang Boss 302 and the Mustang Boss 429. New features for 1969 included quad headlights, front parking lights were now located behind the front valance panel, new quarter panel ornaments, side scoops and integral rear spoiler on the SportsRoof models, front seat back locks, and for the first time, the VIN number, in addition to being located on the driver's door, was also attached to the instrument panel, and visible through the windshield. There were several new Mustang models offered during 1969. A little know model was the Mustang 'E'. It was basically a standard economy minded Mustang SportsRoof model with a six cylinder engine, a higher (lower numerically) ratio rear end with a large torque converter, and an automatic transmission. Air conditioning was not available on the 'E' model. A "Mustang E" insignia replaced the standard quarter panel ornament. Another new model was the Mustang Grande, which included the Interior Decor Group, an electric clock, special houndstooth check upholstery, and extra sound deadner. Another new model was the Mustang Mach 1 which was only available with one of the five larger V-8 engines. It featured special interior trim, special carpet, and high back bucket seats. On the exterior, the Mach 1 featured a low-gloss black hood, non-functional hood scoop (except models equipped with the 428 Cobra Jet engine which had a "new for 69" shaker scoop), hood pins, dual racing mirrors,special side stripe, pop-open gas cap, and dual exhaust ending in chrome, quad outlets. The Mustang Mach 1 also included the "Handling Suspension" and an additional 55 pounds of sound deadner and insulation materials. Another new model for '69 was the Mustang Boss 302. Built mainly to qualify the Mustang for the SCCA (Sports Car Club of America) Trans-Am series. The Boss 302 included a special 290 horsepower, 302 engine, 4 speed transmission, 16:1 ratio steering box, and a 3.50:1, staggered shock rear end. The exterior featured a low-gloss, black hood and deck lid, Boss 302 "C" stripes, front spoiler, flared fenders and Magnum 500 wheels with F60x15 tires. All of the optional Mustang interiors were available on the Boss 302, however, most of them were equipped with the black, standard Mustang interior. The biggest and baddest of the Boss's, the Mustang Boss 429, was also introduced in 1969. Primarily built to satisfy NASCAR requirements, the Boss 429 Mustang featured a Semi-Hemi 429 powerplant. To compensate for the massive engine, the front shock towers were moved out one inch, and the front A-Arms were lowered one inch. The Boss 429 featured a huge hood scoop (the largest ever offered on the Mustang), front spoiler, flared fenders, dual racing mirrors, and F60x15 tires, mounted on chrome, Magnum 500 wheels. The interior featured the Mustang interior decor group, comfortweave bucket seats, and console. The Boss 429 also featured a competition suspension, rear stabalizer bar, power front disc brakes, power steering, engine oil cooler, trunk mounted battery, and a 3.91:1, traction lock rear end. There were a total of 299,824 Mustang's built in 1969.